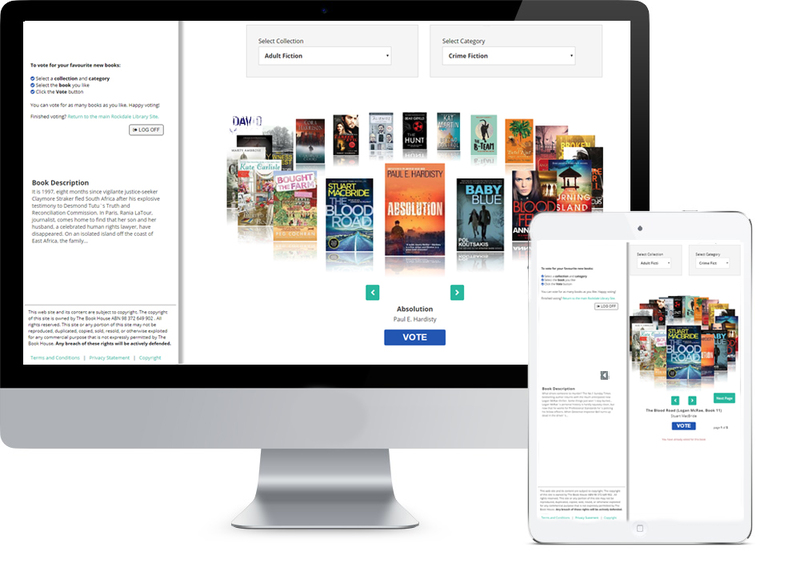 Vote for the new books you would like at your library! Each month you will see a new selection of titles to choose from. This web site and its content are subject to copyright. The copyright of this site is owned by The Book House ABN 98 372 649 902 . All rights reserved. This site or any portion of this site may not be reproduced, duplicated, copied, sold, resold, or otherwise exploited for any commercial purpose that is not expressly permitted by The Book House. Any breach of these rights will be actively defended. We take the security of our customers' personal details very seriously. We do not give out information about our customers and your personal details are protected by your username and password. Any credit card details you send us are encoded with secure socket layer (SSL) encryption. We do not trade, sell, rent your personal details to third party vendors, whether it be sales, traffic patterns and related site information. Any information disclosed from statistics is general and in no way contains any personal details. You must not transmit or attempt to transmit any material of any kind to this web site, which contains a virus, malicious computer code or other harmful component or otherwise attempt to alter any of the content on this web site. The information that is provided by you is referred to as 'User information'. When you provide any user information, you are representing and warranting that all of the information provided is true and correct and are agreeing to indemnify The Bookhouse for any losses or expenses that The Bookhouse may suffer if any of this information is not correct. These terms and conditions govern the use of this web site and the purchase of any goods from it. Please take the time to read these terms and conditions prior to ordering from this web site. The Book House web site is owned and operated by The Book House, which is a subsidiary of Book House Trading Pty Ltd (ABN 55127703360). By browsing or purchasing from this web site, you agree to be bound by these terms and conditions as amended from time to time. All prices quoted are in Australian dollars. Most goods and services including postage attract a 10% GST when delivered in Australia. Prices are subject to change without notice. Whilst we try to keep prices accurate, some of the web site prices may differ from the actual price at the time of ordering and despatch. If this occurs, we will contact you for instructions before sending you the goods. Titles displayed on our web site are usually in stock, or can be obtained from Australian publishers within 10-15 working days. If stock has to be ordered from overseas outlets, the delay may be 3-5 weeks. These delays are unfortunately beyond our control but rare. We will expedite all orders and keep you advised. At The Book House, we take exceptional care to provide our customers with the best possible service. We will refund or replace books ordered if they are received in a damaged condition or are faulty if returned within 30 days of receipt of order. We will make every effort to process return items for credit within 7-10 business days. Please note that it may take one or more billing cycle for the bank to credit your statement. You may cancel all or part of your order, provided that you advise us before your order has been despatched. At The Book House, we endeavour to publish up to date RRP, and we aim to carefully check all prices on an ongoing basis. On occasions, publishers will change prices without notice, and our purchase price will be affected. The Book House will not accept responsibility for any price changes made by the supplier. Imported books are priced depending on the current foreign exchange rate. Please note that prices may vary due to currency fluctuations between time of quote and actual time of delivery. If prices alter after placement of your order, we will email you of the changes and seek your approval for shipment. You agree that your access to, and use of this site is subject to these terms and all applicable laws and at your own risk. This site and its contents are provided to you in 'as is' basis, the site may contain errors, faults and inaccuracies and may not be complete and current. The Book House makes no representations or warranties of any kind, expressed or implied as to the operation of this site or the information, content or materials or products included on this site, except as otherwise provided under applicable law. The Book House cannot guarantee that any file or program available for download and/or execution from or via this site is free from viruses or other conditions that could damage or interfere with data, hardware, or software with which it might be used. You assume all risk of use of all programs and files on this -----site, and you release The Book House of all responsibility for any consequences of its use. You can vote for as many books as you like. Happy voting!